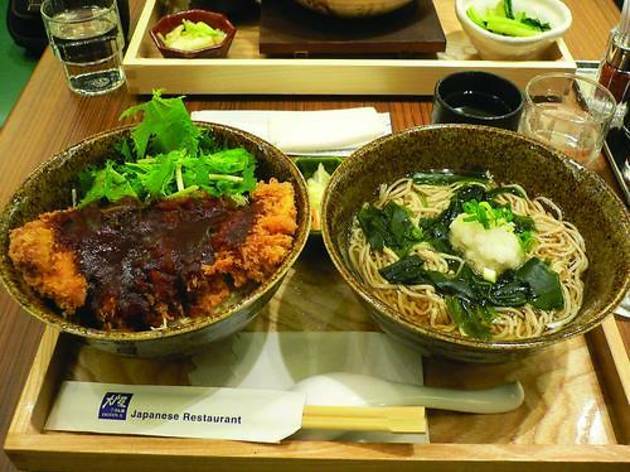 This new Japanese eatery in the Shama building opposite Times Square specialises in simple fare such as donburi (rice topped with meat or fish), stews served in ceramic pots, classic katsu (breaded and deep-fried pork or chicken), and noodles, both hot and cold. Most come as a set with noodles or rice (sometimes both), and a small selection of side dishes can round out a meal. The dishes are strongly influenced by Okinawan and Katsu style cooking. 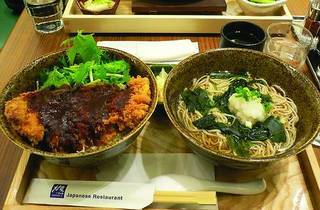 A soba set included soba noodles neatly arranged on a wooden tray and a deep bowl of rice-topped chicken katsu ($70). The noodles were unpleasant but they and their dipping sauce tasted no different than countless other versions around town. Not only was the katsu over-breaded but it dripped with oil and the chicken itself had scant flavour. What’s more, the rice was so overcooked that it had turned into a mushy mash and even a drizzle of the accompanying daikon’s pickling liquid failed to enliven it. Slightly tastier was the unagi donburi ($95), grilled eel that’s been marinated in soy sauce atop a small steamer basket of rice. The eel was satisfyingly rich but it sat atop the same lacklustre rice as the katsu. An accompanying bowl of cold somen bathed in a light broth were deliciously chewy while a natto-like paste and thinly sliced okra added a hint of slipperiness to each slurp. The waitstaff rushed about and seemed to disappear whenever customers were ready to order. A steady flow of hip young shoppers, mainly dressed in black, kept Ootoya abuzz but no one lingers. Just like the food’s flavours.